The Israeli Occupation Forces (IOF) arrested last night 18 Palestinians from Tulkarem, Jenin, and occupied Jerusalem, Palestinian Prisoners Society revealed. Two Palestinians were arrested in Jenin including the ex-detainee Bilal Diab who was released from Israeli jails after 78 days on hunger strike. Two other arrests were carried out in Tulkarem. 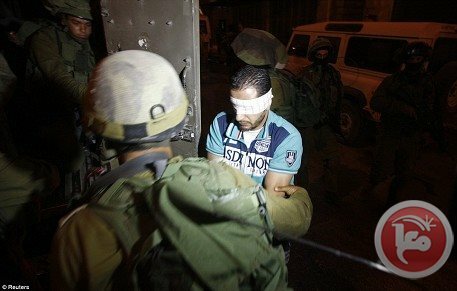 14 Jerusalemites were detained by Israeli police last night till dawn today, the sources underlined. The detainees are scheduled to be brought to court today. IOF also kidnapped a Palestinian citizen on Saturday during clashes that broke out in al-Khalil. The detainee was taken to an unknown destination. Local sources told the PIC reporter that violent clashes erupted near the detainee’s home where gates of the nearby shops were blown up and heavy tear gas and sound bombs were fired. Meanwhile, Israeli police arrested 16 Palestinians in Haifa after suppressing a solidarity march in support of Gaza under the pretext of being organized without permit. The march was organized by Youth Movement in 1948 occupied Palestine. The protesters closed the main street in the city for few minutes before being suppressed by Israeli police. Scores of Palestinian young men suffered injuries in different clashes on Friday with Israeli soldiers in occupied Jerusalem and areas near Ramallah city, according to local sources. Eyewitnesses told Quds Press that the Israeli occupation forces (IOF) brutally attacked the weekly anti-wall march in Ni'lin village, and caused many protestors to suffer bullet and tear gas injuries. They added that Israeli soldiers ambushed young protestors in nearby olive fields, where the segregation wall is located and fired live and rubber bullets at them. The Ni'lin march was dedicated this week to protesting Israel's wanton aggression against the Palestinians in Gaza. In Ofer area, nine young men suffered rubber bullet injuries and others suffocated from tear gas during pro-Gaza confrontations with Israeli troops outside Ofer military prison. Tear gas and stun grenades were also fired deliberately at journalists as they were covering events in Ofer. In the north west of Jerusalem, a young man was wounded and two others were arrested when Israeli soldiers attacked a pro-Gaza march in Beit Surik village. The clashes erupted after Palestinian citizens protesting Israel's war on Gaza marched following the Friday prayers to Har Adar settlement, which was illegally established on Palestinian-owned lands in the village. Dozens of Palestinians were injured in Jerusalem after clashes broke out with Israeli forces at the Al-Aqsa compound in the Old City on Friday amid heightened tensions after the Israeli invasion of Gaza the day before. Dozens suffered bruises, fractures, and cuts in clashes that broke out in the holy compound as Israeli forces raided the area firing stun grenades, rubber-coated steel bullets, and assaulted paramedics and journalists who were forced out of the compound during the clashes. Medics told Ma'an that more than 110 injured arrived at the Al-Aqsa clinic, a number of whom were transferred to hospitals. Al-Aqsa director Omar al-Kiswani, and the Palestinian Authority's Jerusalem minister Adnan al-Husseini were shot with rubber-coated steel bullets in the foot and thigh respectively. The Islamic endowments board director Abdulatheem Salhab and Fayez an-Obaidi were shot with rubber bullets in the chest. 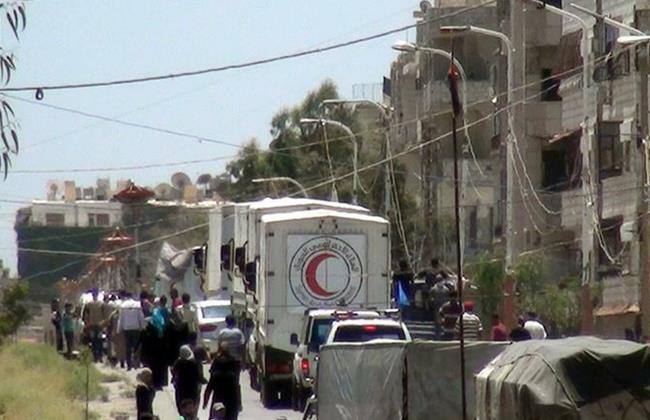 A total of nine people were taken to Makassed hospital, director of the Red Crescent ambulance service Ayman Abu Ghazala said. Abu Ghazala said that Israeli forces used a new type of rubber-coated steel bullets, replacing the old "blue type" with a new "black type" that causes cuts. One of the injured was shot with a rubber bullet near the lungs which caused him to bleed and vomit blood, and he was also suffering from bruising in the ribs when he was brought to the clinic. He was subsequently taken to a hospital in serious condition. An elderly man was injured with a stun grenade that hit him near the eye, and another was hit with a grenade splinter in the chest. Three women, meanwhile, suffered fractured toes and were taken to a hospital. Five others suffered from various head injuries. Israeli police spokesman Micky Rosenfeld said that "masked Arab rioters" had been "throwing stones at officers" and that 12 Palestinians were arrested during the clashes. Tensions have been running high in recent weeks, after Israeli forces launched a massive campaign across the West Bank in June that led to 10 deaths, 130 injuries, and more than 600 arrests, which was subsequently followed by Operation Protective Edge in Gaza, which has killed nearly 300 Palestinians in the last 11 days. Seven Palestinians were injured in clashes with Israeli forces overnight Thursday in the Ramallah village of Silwad, locals said. 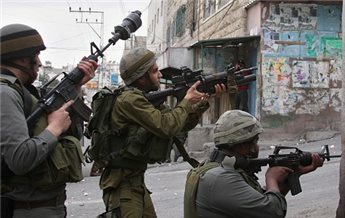 Israeli forces raided Silwad and clashed with local youths, who threw rocks, bottles and Molotov cocktails at soldiers and settler vehicles. Seven youths were injured as soldiers fired tear gas canisters, rubber-coated steel bullets and live fire at protesters. Witnesses said Israeli soldiers deliberately fired tear gas canisters into Palestinian homes. Forty-six Palestinians were injured in clashes in the central West Bank on Friday as Israeli forces dispersed widespread demonstrations in solidarity with the besieged Gaza Strip. Demonstrations took place in Budrus, Nilin, and Ofer prison near Ramallah, as well as in the village of Biddu near Jerusalem. Nine Palestinians were injured with rubber-coated steel bullets, and several were injured as a result of suffocation by tear-gas grenades during clashes near the Israeli prison of Ofer, west of Ramallah. Palestinian demonstrators headed towards Ofer in a march after Friday prayers and clashes erupted as soon as they approached the area after Israeli forces fired tear-gas grenades at the march. Israeli forces also shot tear-gas grenades at journalists who were covering the march. Thirty Palestinians suffered from excessive tear gas inhalation during clashes with Israeli forces in the village of Biddu northwest of Jerusalem. Islamic and nationalist parties arranged a joint march after Friday prayer that set off towards the Israeli settlement of Har Adar near the village, but Israeli forces fired tear-gas grenades at marches as they approached the area. They also opened fire with live ammunition, injuring dozens. Israeli forces detained Khalid Abdullah Abu Eid, 21, from Biddu during the march. Three Palestinians were also injured with live fire and dozens suffered from excessive tear gas inhalation during clashes in the village of Budrus west of Ramallah. Israeli forces raided Budrus, a frequent site of demonstrations against the Israeli occupation and wall, and villagers confronted them by throwing rocks and empty bottles at soldiers, who responded with fire. Soldiers chased youths in the alleyways of the village, while local youths threw rocks and empty bottles at soldiers until they left. 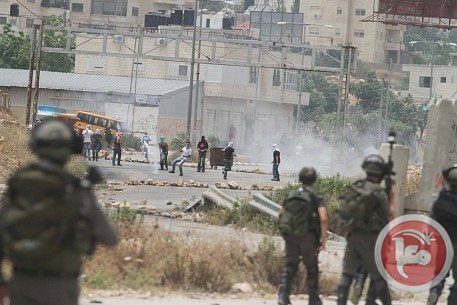 Clashes with Israeli forces also broke out in village of Nilin west of Ramallah, where a Palestinian was injured after being shot with live fire, four others were injured by rubber-coated steel bullets, and dozens from tear gas during clashes. Dozens of youths participated in a march against the Israeli assault on the Gaza Strip after Friday prayers. Israeli forces shot live fire, tear-gas bombs and stun grenades at the youths, who threw rocks and empty bottles. Soldiers shut the entrance of the town and prevented cars and residents from coming in or out of the village. 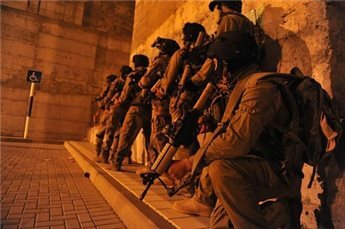 The Israeli Occupation Forces (IOF) waged at dawn Thursday an arrest campaign throughout the West Bank focusing mainly on al-Khalil. Ahrar Center for Prisoners Studies confirmed in a statement issued on Thursday that 8 Palestinians were arrested in al-Khalil. In Bethlehem, Israeli Special Forces arrested an 18-year-old youth after brutally attacking and beating him. IOF soldiers also stormed the journalist Alaa al-Titi’s home in an attempt to arrest him but he was out. Meanwhile, clashes continued between Palestinian youths and IOF soldiers following the arrest campaign targeting Palestinian MPs and academics. PA Security Forces, in their turn, continued to suppress any attempt for the outbreak of clashes or confrontations with Israeli soldiers. Israeli forces notified the family of prisoner Hossem Qawasmi that their home in al-Khalil would be razed within two days. The detainee Qawasmi was re-arrested last week. He had already served 10 years behind Israeli bars. His two brothers are also jailed in Israeli prisons, while his third brother was deported to Gaza after being released in Wafa al-Ahrar Swap Deal. 20 Palestinians were arrested in Bani Neim town in al-Khalil including two members of Palestinian Legislative Council. Dozens of youths were injured including 6 with live bullets during clashes that erupted in different towns near the city, while a large march was organized in al-Khalil in solidarity with Gaza Strip. In Nablus, an Israeli undercover unit kidnapped on Tuesday a Palestinian young man from Sibsitia town. According to eyewitnesses, a civilian car with a Palestinian registration plate carrying 4 members of IOF undercover units stopped at Rafidya Hospital’s entrance and kidnapped the young man Koutaiba Azem after brutally beating him. Azem’s arrest came shortly after his release from PA jails where he was arrested for his participation in a solidarity sit-in in support of hunger strikers in Israeli jails. IOF troops also arrested a Palestinian young man after raiding his home and confiscating a car belonging to a detainee. 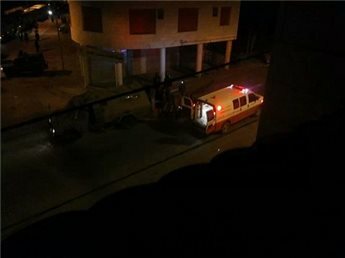 A Palestinian was shot and injured Thursday evening by Israeli forces in Eraq Burin village south of Nablus. Local sources at the village told Ma’an that a number of Israeli soldiers shot directly at Muhannad Yusif Qadan, 20, hitting him in the back. He was taken to Nablus Hospital to be treated for moderate to light injuries. A Palestinian youth was shot and injured with a live bullet, on Wednesday at dawn, during one of several confrontations occurring between Palestinians and Israeli forces across the Hebron area. Additionally, two Palestinian families have served with papers notifying them of Israel's intent to demolish their homes, for alleged involvement in the deaths of 3 missing settlers. According to WAFA correspondence, the 23-year-old Palestinian was shot in the foot with a live bullet during clashes which erupted at Halhoul Bridge, near Hebron’s northern entrance. He was taken to a hospital for treatment. Confrontations also erupted in Bab Al-zawya area, at the Hebron trade center, Ras Al-Jura, and in the town of Beit Ummer, all located to the north of Hebron. Soldiers fired live ammunition, rubber-coated steel bullets, tear gas and sound bombs towards residents, causing dozens to suffocate from tear gas inhalation. The notices gave the families of Amir Abu Eisha and Marwan Al-Qawasmeh two days to submit a written objection to the demolition to be sent to. 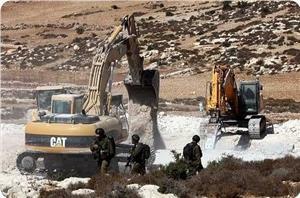 Two men, Marwan al-Qawasmeh, 29, and Amer Abu Eisha, 33, stand accused of the abduction and murder of the 3 settlers. 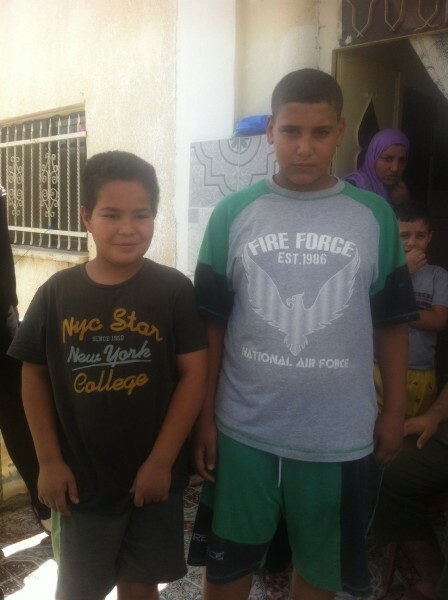 Their homes have been since destroyed by Israeli forces, despite denial of any involvement coming from family members. According to Press TV, Ayelet Shaked of the ultra-nationalist Jewish Home Party has, in fact, called for the slaughter of Palestinian mothers who give birth to what she called "little snakes." Furthermore on Wednesday, in the Hebron district, the Israeli army arrested 12 Palestinians, including two members of the Palestinian Legislative Council (PLC), during predawn raids across the southern West Bank district of Hebron, according to security sources and witnesses. Scores of Palestinian youths sustained severe bullet injuries in a round of violent clashes with the Israeli occupation forces (IOF) across different axes of al-Khalil at dawn Wednesday. Local sources said Palestinian youngster Abd al-Halim Zama'ra was shot with live ammunition while dozens of other young men sustained rubber bullet and gas injuries following a series of random incursions by the IOF into Beit Ummar village. The Israeli occupation troops left another Palestinian youth severely wounded due to the heavy firing of live ammunition throughout the clashes that burst out in Bab al-Zaouia. Dozens of civilians were injured by IOF rubber bullets throughout. IOF attacks culminated in house demolition threats targeting the homes of the wanted citizens Marwen al-Qawasmi and Amer Abu Isha charged for potential involvement in the death of the three Israeli settlers a month ago. The Israeli soldiers have already stormed the two homes and blew up some of their interior corners and entries with no prior notice. Yesterday, in the village of Deir Istiya, two young boys, Hasim Abu Zeed (13) and Hathem Yaser Abu Zeed (9) were attacked by Israeli settlers. Every day Hasim and Hathem’s family have to cross a road, which separates their homes from the village. This puts them in a dangerous position, exposing them to settler harassment and violence. Yesterday evening when they were passing a road to visit a store in the village, a car drove by and dragged the two boys inside. 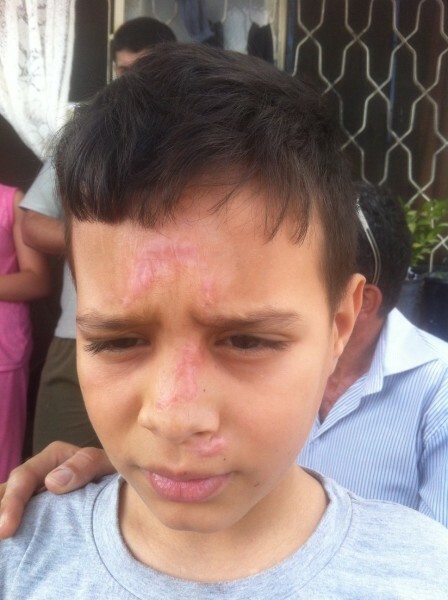 Hasim screamed, causing people to wake in the village, this appeared to unnerve the settlers and the two boys managed to escape into the olive fields, close to their house. While the boys ran, one of the settlers pulled out an M16 and tried to shoot them, and also fired into the sky. Thankfully neither boy was injured. When the Israeli soldiers arrived, they offered the family protection for four days, but left after an hour. The family is now extremely frightened; especially as this was not the first time one of their children was targeting by colonial settlers. Seven months ago, Hathem’s younger brother, Ibrahim Yaser Abu Zeed (8) was crossing the street when a settle car ran him over, dragging him several meters before driving away. When the boy was found his wounds were so severe that it seemed likely he would die. He was taken to a hospital located inside the state of Israel and fortunately survived, traumatized and badly injured, he returned to his family. Several months later, he still has to use a prescribed cream on his wounds to help the scar tissue heal. The cream costs 170 shekels, which is a serious financial burden. Physical violence from settlers in Deir Istya is not uncommon; the situation is the same in so many other Palestinian villages close to illegal settlements. Deir Istya is being surrounded by settlements, which continue to steal more and more Palestinian land. The village itself is located in area A (under full Palestinian Authority civil and security control), but it is surrounded by area C (under full Israeli military civil and security control). Nine people in the Zeed family live in in two rooms. The father of the family attempted to erect a tent for his goats beside the house, which Israeli soldiers immediately demanded him to destroy himself, or they would force him to pay them to destroy it. Three extremist Israelis assaulted a Palestinian lawyer and a woman in Deir Yassin in west Jerusalem. A Ma'an reporter said the three pepper-sprayed lawyer Sanaa Dweik and a woman that was with her when they were leaving a courthouse in western Jerusalem. Dweik added that the extremists fled and pedestrians who were in the area did not try to catch them, call the police or an ambulance; two Arab young men were passing by and called authorities. The lawyer highlighted that this was the second time she was assaulted; the first was during the Israeli offensive on Gaza in 2012 when seven extremists punctured the tires of her car and attempted to stab her with knives. She managed to lock her car and call the police who arrived and detained them. Dweik added that the suspects appeared to be in their early to mid-20s. Israeli forces detained five Palestinians late Monday during clashes in the town of Abu Dis. 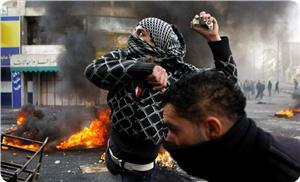 Clashes erupted following a demonstration against the Israeli military offensive in the Gaza Strip. A spokesperson for a local popular committee told Ma'an that dozens demonstrated against the war on Gaza before Israeli forces fired tear gas, stun grenades and rubber-coated steel bullets at the crowd, inuring 3 people. Two of the detainees are paramedics with the Red Crescent, Ismail Hajja and Samed Qbeisha. Violent clashes continued in different parts of the West Bank between Israeli occupation forces and Palestinian youths who took to the streets in support of Palestinian resistance and in protest against Israeli aggression on Gaza. 20 Palestinians were arrested on Monday including a member of the Palestinian Legislative Council (PLC), while 25 citizens were shot with live bullets in al-Khalil, Bethlehem, and Qalqilya. On the other hand, a state of tension prevailed among Palestinian worshipers in al-Aqsa Mosque when Israeli forces prevented women and youths under the age of 35 from having access to the mosque. Israeli forces had earlier attacked a number of women and girls at al-Aqsa Mosque gates, and allowed at the same time Israeli settlers led by the extremist rabbi Yehuda Glick from breaking into the mosque. Sowaidan family, from Silwan town in occupied Jerusalem, said that their 11-year-old son Sultan is missed since yesterday night till this moment. Violent clashes broke out in different neighborhoods in occupied Jerusalem’s Old City. In Ramallah, 4 Palestinian youths were arrested after storming and searching their homes in Silwad town and attacking their family members. 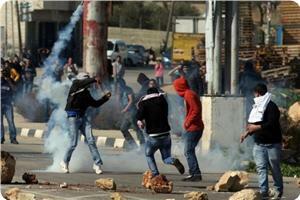 Clashes erupted near Pisagot settlement built on al-Bireh’s lands. A number of breathing problems were reported after inhaling tear gas bombs during the confrontations. In Bethlehem, four Palestinians were detained including a deputy at the Palestinian Legislative Council. Five citizens were injured including two wounded with live bullets during confrontations that erupted at Bethlehem checkpoint when Palestinians marched in support of Gaza. Similar clashes were reported in Marah Rabah and Hossan towns near the city. No arrests were carried out. For its part, Student Union Council organized a solidarity vigil at Bethlehem University in support of Gaza Strip. In al-Khalil, 20 Palestinians were injured including 6 with live bullets when Israeli forces suppressed a solidarity march in support of Gaza people. 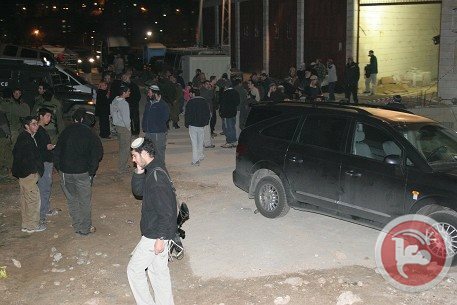 Palestinian angry youths threw a Molotov cocktail at Kiryat Arba settlement, while clashes erupted at Bab al-Zawiya in the city. In Jenin, PA forces suppressed a night march in solidarity with Gaza and brutally attacked the participants. Palestinian youths in their turn set fire to car tires before being beaten and attacked. PA security forces work hard to prevent the outbreak of a third Intifada (uprising) in the West Bank as part of the security coordination with the occupation. 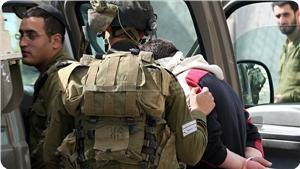 Two Palestinians were arrested in Jenin by Israeli soldiers. In Nablus, a large march was organized last night, while Israeli forces fired tear gas bombs at the participants. Israeli forces also summoned a Palestinian activist in prisoners’ issue after raiding and searching his home in Tubas which witnessed a night march organized by masked members of Hamas and Jihad movements in the city. At least one person was injured during clashes that broke out in Qalqiliya between Palestinian youths and Israeli forces. Three young men were arrested during the clashes. At least seven Palestinians were shot and injured in clashes with Israeli forces overnight in Hebron and Bethlehem, witnesses said. Locals told Ma'an that clashes broke out in Hebron, Beit Ummar and Halhul as demonstrations took place against Israel's assault on Gaza. Medics said five Palestinians were shot with live fire in Halhul and were taken for treatment at a nearby hospital. Another man shot was in the foot in Beit Ummar. Several protesters were wounded by rubber-coated steel bullets in Hebron. In Bethlehem, a Palestinian youth was shot in the thigh with live fire and taken to Beit Jala hospital for treatment. 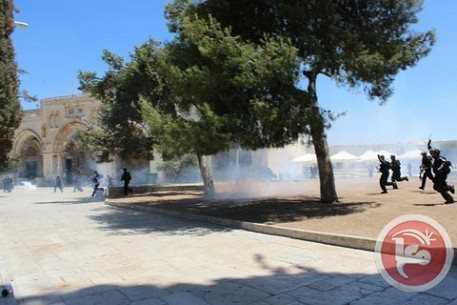 Several people were treated at the scene for tear gas inhalation following clashes near Rachel's Tomb. At least 23 Palestinians were abducted by Israeli forces, during overnight raids throughout the West Bank, including several Members of Parliament. Further confrontations near Rachel's Tomb have been reported at Aida refugee camp, near Bethlehem. A number of Palestinians have been reported injured by the Palestinian News Network (PNN). Some took live fire, while others were wounded with rubber-coated bullets, with further reports of teargas suffocation continuing to surface. This particular arrest campaign began with clashes which erupted, all over the West Bank, in solidarity with the victims of Israel's assaults on the Gaza Strip, as well as other violations. In Teqoa and Joret el-Shama, 3 identified as Mahmoud Kamal Sabah and Mouhanad Nasser Al Taamreh, both 20, were also reported abducted. In Ramallah, soldiers took Palestinian PM Fadel Hamdan. Further abductions by Israeli forces occured in the northern West Bank, where two Members of Parliament, Khaled Said Ibrahim, 52, was taken from the Jenin neighborhood of Al Jabryat, and Ibrahim Saleh Mohammad Dahbour, 53, from Araba village. In nearby Nablus, soldiers kidnapped yet another Palestinian MP named Reyad Al Amleh, from the village of Qablan, in addition to one Abedel Satar Qassem, who is a professor at the National Al-Najah University. In Tulkarem, to the West, two Palestinian Members of Parliament were also taken into custody: Fathi Al Qarawi, from Nur Shams refugee camp, and Reyad Radad, from Sayda village. In Salfit, Israeli soldiers kidnapped the former Palestinian Minister of Finance, Oumar Abdel Raziq. To the south, in Hebron, forces abducted 12 Palestinians, including 3 Palestinian MPs, after breaking into their homes and beating them in front of their families, PNN further reports. The victims have been identified as brothers Elayan and Jafar Al Qwassmi, Anwar Al Joulani, 35, Adnan Al Zouro, 34, brothers Tamer, Wael and Tarek Al Taweel, Waheeb El-Natsheh, and Palestinian MPs Nayef Al-Rjoub, from Doura, Mohammad Abu Jhysheh from the village of Ithna and Mohammad Ismail Al Tal, from Al Thahryeh. 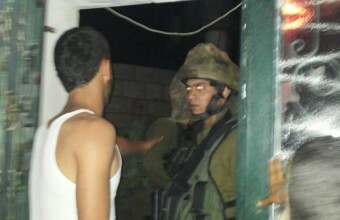 Israeli soldiers also raided and searched several other Hebron homes. 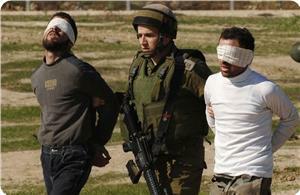 In the Bethlehem district, four Palestinians were kidnapped from the villages Joret el-Shama, Al Ma'sara and Teqoa. Around 2 a.m., Israeli forces raided the homes of Mahmoud Zwahre and Mohammad Brejiya, in Al Ma'sara, where soldeirs searched their houses and beat them both in the street. They then took them away, most likely to a police station located in the illegal Gush Etzion settlement, according to local sources. Mahmoud is a well known member of the Popular Resistance Committees. Yesterday evening, around 60 soldiers opened the gate of their military base and broke into Aida refugee camp, near Bethlehem. The soldiers appeared to be new trainees, according to the PNN. They stood next to the gate for approximately 10 minutes before people in the camp realized what was happening. Some of the youth approached the soldiers and began throwing stones at them. Shortly after, the soldiers started running down the hill, in what it seemed to be a training exercise rather than a response to the stones. Following this, the soldiers retreated, with just a few soldiers remaining inside the camp. A few Palestinians kept throwing rocks and the soldiers responded with stun grenades back. After a few minutes, they too retreated back to the base. Aida refugee camp is located just next to Rachel’s Tomb, one of the holiest sites in the Levant, and is surrounded by a section of the massive Apartheid Wall which cuts through Bethlehem and surrounds the camp. The area is a frequent target for provocation against Palestinians by both Israeli soldiers and settlers.